At USI they had a study abroad contest for students who had studied abroad through programs accredited by the university. I was lucky enough to win first place with my picture called "Through Torrents" and receive an honorable mention for the picture "A Sense of Loss." I love all of the pictures that I entered, but I think the most important part to them is the essay talking about how they represent the influence that study abroad had on our lives. 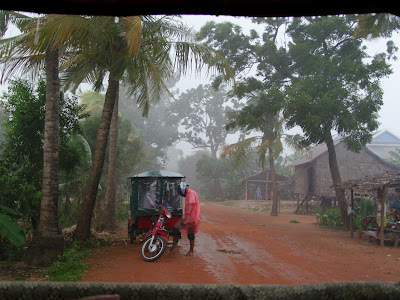 I took this picture immediately after a sudden downpour began in Cambodia after spending the day in the famous Cambodian village. Beyond discomfort and normal sleeping times, the Cambodian people are hard-workers. Misconstrued by their ubiquitous hammocks and propensity towards long conversations over karaoke machines, they have motivation and perseverance to surpass the boundaries lain in their path. They fight through torrential downpours and inadequate governance to meet goals to improve their future. In cities, I met young people from the countryside who had left their homes in search of a better life. Be assured, they did not lose their roots, returning annually to aid their families in the rice harvest. They know that they must take advantage of their opportunities, many working jobs and attending school for an education unavailable to their parents. A large proportion of their paychecks are sacrificed and sent home to their families to put younger siblings through school and provide rice on the table. I learned the value of a dollar in Cambodia. Thirty-five percent of Cambodians earn less than one dollar per day. They work hard and fight towards a better life. What place to do we have to complain of the difficulties of school? We must take advantage of our opportunities and bring the same fortune to those who must go without. I have learned to value my opportunities and make lemonade and take note not to complain of my sore hands while squeezing out the juice. Life takes hard work, and I remain eternally grateful for the fortuitous jump start that I was given. I wanted to capture the destruction to the temples incurred by the Khmer Rouge soldiers during terrifying war years in Cambodia. Culture teaches us about ourselves and our past, providing a foothold for the steps we will take in the future. The Cultural Revolution conducted by the Khmer Rouge in Cambodia attempted to decimate the beautiful Angkorean legacy. 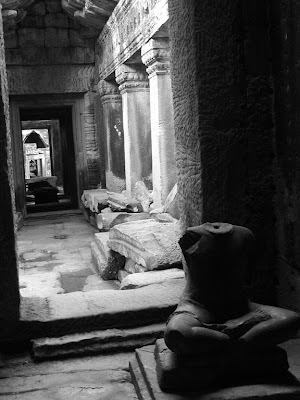 Pillaging temples and desecrating statues, they left nothing in their wake. Without reservation, they hid tanks in these sacred walls and created fortresses upon their hills. AK-47 casings lay forgotten upon the holy paths to this day. Regardless, the Khmer people have taught me the value of culture. In process of rebuilding, they are gaining strength in their identity and self-worth, rebuilding the temples and praying at Angkor once again. The loss of their culture after the Khmer Rouge-proclaimed “Year Zero,” beginning a state with no past and eventually no future, has instilled a deep value of culture preserving it a they lost everything in the war. Once you have lost something, you begin to value it. It is the same with when you see what other have lost, you begin to value the gifts that you have been given. I value both of my cultures and histories since studying abroad. I realized that they have shaped who I am and the person I wish to be. At the same time, I cannot forget the cultures of the countries that have taken me in while studying abroad, because they have made a permanent imprint upon my story that cannot be worn away. I took this picture of one of the children tour guides that took us up the steep mountain temple near Battambang, Cambodia. Cambodian culture represents strength and love—the strength to move beyond the horrors of their past and love for the new generation. 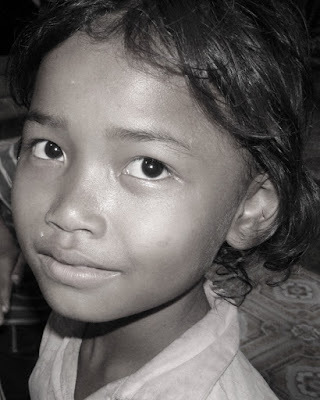 The haunting gleam of hope resides in their children’s eyes glistening in dusty villages and flooded rice fields. No matter the hardships faced, they persevere in search of a better life for themselves and their families. Savorng speaks a few words of English, using her gift as an unofficial temple guide at Wat Sampeau, because, here, children are the only guides to the top of this secluded temple. The children dream of becoming doctors and nurses or teachers and scientists, dreams beyond their raggedy clothes and small village, as they climb the moss-covered steps to pay their respects. I, too, dream of becoming a doctor. Her dreams and hope revitalized my own dreams of helping people around the world have access to a healthy and productive life that they deserve. Someday, I hope to help a child like Savorng transcend all obstacles to fulfill her goals that rests at the tips of her fingers, just barely out of her reach.